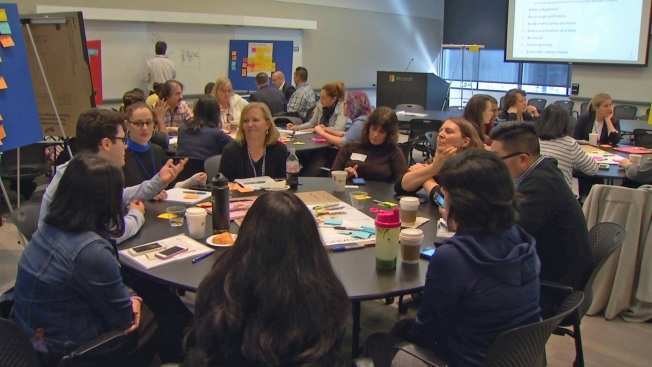 Silicon Valley tech companies, government agencies, nonprofits and foster youth convened Tuesday at the Microsoft campus in Mountain View to “hack” the foster care system. More than 200 people gathered to brainstorm how technology can be used to improve outcomes for youth in the foster system. Delrisha White, 25, cycled through foster homes across the Bay Area until she graduated from high school and went off to college. She graduated, an accomplishment very few foster youth achieve, and now works at the Silicon Valley Children’s Fund helping foster youth navigate the same system she did years ago. White said access to technology can help level the playing field for foster youth dealt challenging life situations. Data show that of the roughly 400,000 youth in the foster system nationwide, 40 percent will experience homelessness within two years of turning 18 and 25 percent will be incarcerated by the time they reach the age of 24. Microsoft, which hosted the event, committed to providing 2,500 laptops to foster teens in California and another 9,000 licenses for Microsoft Windows and Microsoft Office applications. The Santa Clara County Department of Family and Children’s Services, a supporter of the “hackathon,” had staff in attendance exploring opportunities to integrate technology at the agency. Last week, NBC Bay Area's Investigative Unit highlighted a shortage of social workers at the county agency, which currently has 42 vacant social worker positions. Weinberg said technology can help streamline administrative tasks for social workers so they can spend more time in the community. “If we can get the technology, the automation, if we can streamline the system – that’s going to help everybody,” he said. For youth in the foster system, Weinberg stressed how crucial technology is for improving outcomes. Sixto Cancel entered the foster care system in Connecticut before he turned 1. Cancel, now the CEO of the nonprofit Think of Us, said technology gives foster youth the tools to empower themselves. He credits Khan Academy for helping achieve success in his own life, and is now partnering with Box to develop other practical tools for foster youth. The Silicon Valley Hack Foster Care Summit was the fourth hackathon held across the country since 2016. And like so many other ideas that have come from Silicon Valley, organizers hope the solutions conceived of here will go viral and have long-term impacts on the lives of children and teens growing up in foster care.